Edgar Allan Poe (1809-1849), the father of the modern mystery, was born in Boston on January 19, 1809. He was educated in Virginia and England as a child. It was during his later years at West Point that he showed a remarkable propensity for writting prose. As early as the age of 15, he wrote these words in memory of a female acquaintance. "The requiem for the loveliest dead that ever died so young". Indeed, Edgar Allan Poe's first love was poetry, although he was unable to make a living at it early on, he was able to publish two small volumes during these early years. Only after becoming an assistant editor at the Southern Literary Messenger in Richmond, Virginia, in 1835 did Poe's literary talents start to blossom. It was at this time in his life that Poe fell in love with his 13-year-old cousin Virginia. Their marriage forced him to find a source of income. When the editor of the Messenger offered employment, Poe eagerly accepted. Poe was to work for several publications as both editor and contributor. His career as an editor coincided with his growth as a writer. While working in Philadelphia for Burton's "Gentleman's Magazine" in 1839, Poe's work continued to flourish. At this time in his career he still was not secure financially, but his work was being recognized and praised, which helped greatly in furthering his reputation. During his tenure at Burton's he wrote such macabre tales as "The Fall of the House of Usher," and William Wilson. Tales like these psychological thrillers were to become Poe's trademark. In 1841, Edgar Allan Poe began working for a man named George Graham, who offered him 0 a year to work for him as an editor. 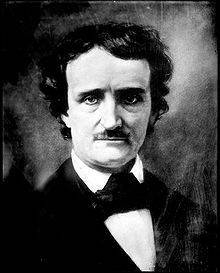 While at Graham's, Poe was preparing his famous work, "The Murders in the Rue Morgue," for publication. It was during these years in Philadelphia that Poe published such trademark horror tales as "The Tell-Tale Heart," and "The Pit and The Pendulum." It wasn't until the 1845 publication of Poe's famous poem "The Raven" that he achieved the true rise to fame that had been denied him until then. The public's reaction to the poem brought Poe to a new level of recognition and "could be compared to that of some uproariously successful hit song today." In February 1847, Poe's young wife died of consumption. Poe was devastated by her death and penned these words, "Deep in earth my love is lying and I must weep alone." During the years following Virginia's death, Poe's life was taking a steady turn downward. He suffered through a suicide attempt, several failed romances and engagements, and a largely unsuccessful attempt to resurrect his failing career after a long bout with alcoholism and depression. Although he lived a short and tragic life, Edgar Allan Poe remains today one of the most-beloved mystery writers in history. His contributions to literature and the mystery genre cannot be underestimated. Don't forget to mention the address of the website you found this biography on.